Assembling a complete date run of Carson City halves (without 1877-CC) 10-20 years ago was an especially challenging project. Without today's omnipresent coin dealers on the Internet, Coin World dealer ads, mail bid lists and coin show bourse floors were the primary vehicles for the pursuit. This Carson City was assembled years ago as one can immediately judge from the old ANACS white holders. The 1873 No Arrows is an especially challenging date and the San Jose Collections offers the Richmond Collection example graded NGC EF40. While I enjoy working with all consigned pieces, there are favorites. In this Carson City lot, you might carefully inspect and consider the 1872-CC and 1878-CC examples. I believe the latter would cross into a mainstream TPG holder and might even CAC. 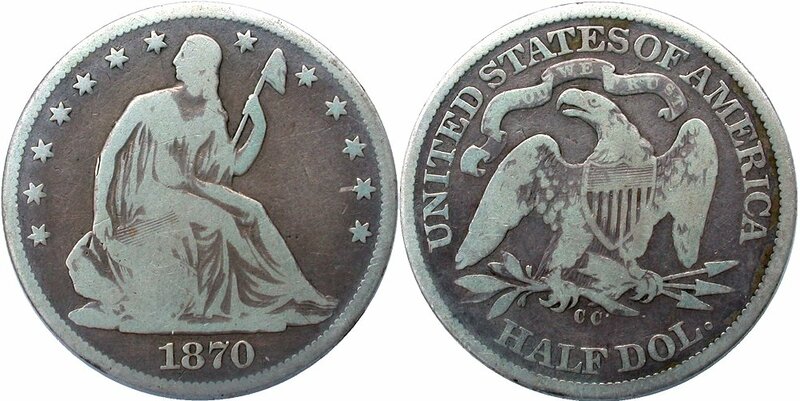 The 1871-CC and 1874-CC halves also deserve attention. The 1875-CC offers proof like surfaces and is the WB-1 variety with an R6 rarity rating. There are many possbilities for GFRC customers attempting to complete a Liberty Seated half set.